Great full-floor condominium with it's own private entrance and attached private parking, within a Queen- Anne corner triplex. 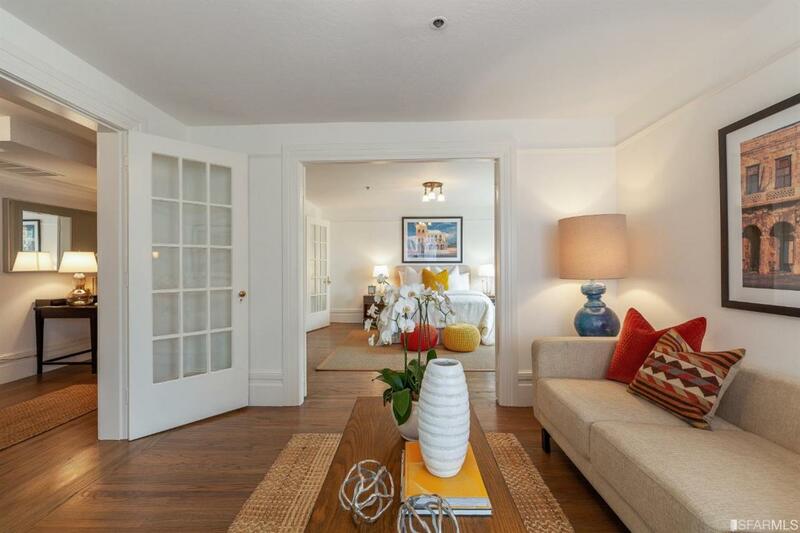 This cheerful 2 bedrooms 1 bath unit is perfectly located within the confluence of Pacific Heights, Marina, and Cow Hollow. The extra area in the home is perfectly suited for a desk and home office. This lovely home has been newly painted and is in beautiful condition with newly refinished hardwood floors, and quintessential bay windows looking out to a front garden entrance. Rear French doors open from the eat-in kitchen to a private open-air patio. The location on this unit is perfect for anyone that wants access to all the amenities of Union St and all Pacific Heights has to offer. Listing provided courtesy of Sandra Deering of Coldwell Banker.